First: if you spend even three seconds a day thinking about rich people, that’s three seconds too many. It never even occurs to me to dwell on the lifestyles of people who have more than I do. That’s what losers do. Let’s say the rich really did hoard cash (they don’t, but we’ll get to that in a minute). Their demand for money (which is a more neutral, less loaded way of describing “hoarding”) has the result of increasing the purchasing power of everyone else’s money. If they “hoard” the money, do not enter the market with it and just roll around in it, that money is therefore not bidding up prices. So prices fall, which makes everyone else’s real incomes rise. 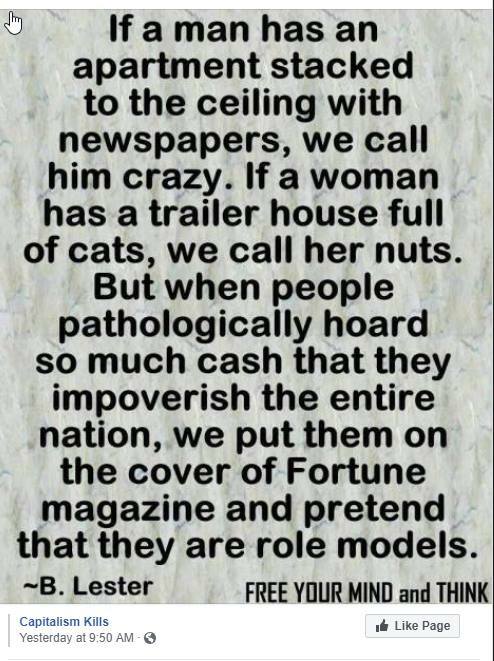 But of course people are not “pathologically hoarding” cash. Talk about uncomprehending. That money is saved and invested. Saving and investment is what allows for capital accumulation, which is what has raised us from a primitive existence to our present condition, where we criticize capitalism on miracle machines inside air-conditioned rooms. It is precisely by not consuming that we make provision for capital goods, which increase our standard of living. We are vastly richer because we use steam shovels instead of regular shovels, modern printing instead of a Gutenberg printing press, and trains rather than carrying goods on our backs. In an economy lacking capital goods, you can protest your employer all you like but there is zero chance you will ever, ever earn $15 per hour. The economy is not physically productive enough to generate that kind of abundance, and your unaided, bare-hands labor doesn’t produce enough to make a wage like that anything but a losing proposition. We also need saving and investment for capital maintenance, to keep the various production processes up and running, so there are goods on the shelves for people to buy in the first place. If all we did is consume — which memes like this seem to think is what makes the economy hum — we would revert to primitive, hand-to-mouth conditions. It is the wicked “rich” and their saving and investing — not “hoarding,” obviously — that make our abundance possible. Labor plays an important role of its own, but labor unaided by capital equipment could perform a tiny fraction of the work that labor aided by capital goods can. And those capital goods come from people who save and invest large amounts of money. If someone finds that “pathological,” may I suggest that that person is not entitled to an opinion? First: there’s a blog and Facebook page out there called the Meme Policeman. Brilliant idea. He’s a libertarian, and he goes around correcting memes of the kind I took apart in today’s letter. His following first took off after he got publicity and a flood of traffic from me. He now has nearly 25,000 followers.